1067 Madison Avenue (81st Street), 212-288-0850, markysonmadison.com. Sister City hotel, 225 Bowery (Rivington Street), 646-343-4500, lastlight.nyc. 129 West 29th Street (Avenue of the Americas), snlrestaurant.com. Traditional Turkish fare has come to a neighborhood better known for Greek food. Braised artichokes, muhammara (red-pepper spread), manti, lamb with okra, and baked cauliflower share the menu with Turkish versions of stuffed grape leaves and moussaka. 3116 Broadway (31st Street), Astoria, Queens, 718-728-4477. Appropriately enough, subway tiles decorate this bar in the Columbus Circle station, a welcome watering hole amid a collection of food kiosks. Turnstyle Underground Market, 1000S Eighth Avenue (59th Street), turn-style.com. 560 Lexington Avenue (50th Street), godiva.com. This urban winemaking, restaurant and music enterprise, which opened in 2008, will close on Aug. 1. 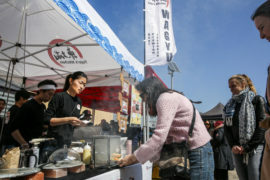 It is to reopen early next year on Pier 57 in Hudson River Park at West 15th Street, the former Marine & Aviation Pier that was to house a street-food market planned by Anthony Bourdain. At 32,000 square feet, it will be 50 percent larger than its original building, which will be taken over by Disney, and about the same size as the City Wineries that have opened in seven other cities. Michael Dorf, the founder and chief executive of City Winery, said the new location would also feature a 350-seat concert hall, a 150-seat loft for performances, a 100-seat restaurant and tasting room with 12 taps dispensing wine, and a full winery that will be visible inside and out. City Winery has a vineyard and restaurant on Pier 26 (Hubert Street) and will open a winery in the Hudson Valley later this year. Google will occupy most of the space, and there will be a food market of some kind. Pier 57 (West 15th Street). This Italian spot, one of several from Sant Ambroeus Hospitality Group, will open this summer in the Chambers Hotel, taking over the restaurant space from David Chang. The Princess Diner, a beacon where the highway through Southampton, N.Y., thuds to a bumper-to-bumper halt at Water Mill, closed last year after decades in business. But it will be reborn this summer, with a new name and under Eric Miller, who was the chef and owner of Bay Kitchen Bar in East Hampton for six years. Bostwick’s on the Harbor, a seafood restaurant in East Hampton, will take over what was Bay Kitchen Bar. This promotion to support black-owned enterprises, including food trucks, chefs, caterers and restaurants, keeps expanding. This year, it has kicked off in Houston and will run through April 28. It will continue in Philadelphia from June 9 to 23; New Orleans from June 28 to July 7; Indianapolis from July 21 to 28; Los Angeles from Aug. 11 to 18; Atlanta from Sept. 1 to 15; Oakland, Calif., from Sept. 29 to Oct. 6; and Dallas from Oct. 13 to 27. Mr. Buliskeria, an Israeli chef, has become the executive chef at Bustan on the Upper West Side, which just reopened after a fire in November. Ms. Rozenblat, also from Israel, is the new pastry chef. This chef, whose Greenpoint restaurant Pretty Southern has closed, will open Morty’s Oyster Stand this summer in what was Cyril’s in Napeague, N.Y., between Amagansett and Montauk.